Happy Sunday! So I just wanted to share these super cute slides that I have collected over the past couple of summers and to be completely honest, I really don't like the look of slides. I know, I know, then why am I blogging about them then right? Well, I tried a few pair and they were super comfortable. Comfort, for me, is always key. I used to be the woman that would forfeit comfort for style, for the on trend look in my 20s. However, as I have gotten older, taking care of myself, which includes caring for my feet means buying shoes that are comfortable. 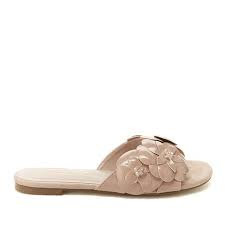 I think of slides as a great alternative to flip flops, which are really bad for my feet because of their lack of arch support and flimsy sole. While the slides aren't meant to be super supportive, they offer a little more style and allow me to put insoles in for added support. Check out my pics below and let me know which ones you like the most! Have you gotten into the slide trend? What's your go-to summer sandal look? As always, like, comment and follow and thanks for reading! 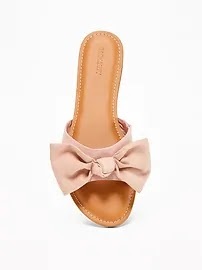 I love these pearl slides by Free People, you can find them here! I love bows and these are super cute from Old Navy, you can find them here. I also love these slides by Nanette Lepore, you can find them here.